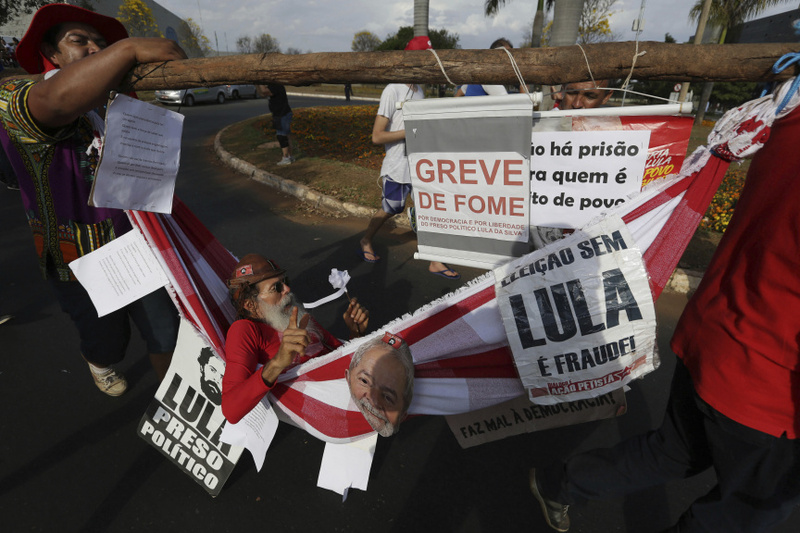 BRASILIA, Brazil (AP) — The Workers' Party registered jailed former President Luiz Inacio Lula da Silva as its candidate for president Wednesday, attempting to muscle him into the race to lead Latin America's largest nation and forcing a showdown with Brazilian electoral authorities. More than 10,000 of da Silva's supporters flooded the area around the Supreme Electoral Court in Brazil's capital, while party leaders went inside to file the candidacy on the final day for registering. Soon after, Workers' Party Chairwoman Gleisi Hoffmann emerged, proudly showing reporters the proof of registration. Former Sao Paulo Mayor Fernando Haddad was registered as the left-leaning party's vice presidential candidate. "I will only not be a candidate if I die, give up or am ripped from the race by electoral authorities," da Silva said in a message read to the crowd by Haddad. "I don't expect to die. I will not give up. And I will fight for my rights in the electoral justice system until the end." Da Silva is serving a sentence for a corruption conviction, but he continues to lead polls for October's presidential election. The electoral court is expected to bar him from running because of the conviction. Da Silva and his supporters insist he is innocent, contending the charges were trumped up to prevent him from returning to the presidency. Hours after the party registered, Attorney General Raquel Dodge filed a request at the electoral court seeking to bar da Silva from running. Several others, including leaders of conservative groups, did the same. Supreme Court Justice Luis Roberto Barroso will handle the case himself or share it with a full panel of the electoral court. Both Dodge and Barroso have suggested in the past that da Silva's bid to run again for president would not be allowed. The police presence was heavy around the court during the day, though the rally was peaceful. Many of the supporters wore red shirts or T-shirts with da Silva's face on them. Some more masks of his face. The crowd shouted: "Free Lula!" or "Lula, warrior of the Brazilian people!" Da Silva is revered in many parts of Brazil for his humble beginnings and for sharing the fruits of the country's boom years with the poor and working classes. But his conviction and the question over whether he can run for office has split Brazil, where some see his jailing as proof that no one is above the law and others feel he is being persecuted by a justice system being manipulated to prevent him from taking power again. Brazilian law bars anyone like da Silva who has had a conviction upheld from holding office, though the court has the final say. "We don't even think about the possibility (of an election without da Silva) because an election without Lula would be a fraud," Elen Neves, a 22-year-old farmer from Parana state, said, using the name most Brazilians call the former president. "But if by any chance his candidacy is rejected, we will keep fighting for him to achieve the presidency." Haddad emphasized that da Silva's political rights have not yet been suspended and that he is still appealing his conviction. It is unclear how long the electoral court's decision will take, but the Workers' Party has until Sept. 17 to put someone else at the top of its ticket if da Silva is barred from running. It is thought that Haddad would take his spot. Da Silva was convicted last year of trading favors with a construction company in exchange for the promise of a beachfront apartment. That conviction was part of the huge "Car Wash" corruption investigation in which prosecutors have alleged that Brazil's government was effectively co-opted for years, with politicians doling out favors and state contracts in exchange for bribes and campaign contributions. The investigation has shaken Brazil's political system and put dozens of powerful people in jail, including some of the country's richest men.